What we first noticed after scanning their cooked food on display was the vibrancy and variety of the food. Besides pre-arranged healthy bowls, the main draw of Grain Traders is their DIY bowls. 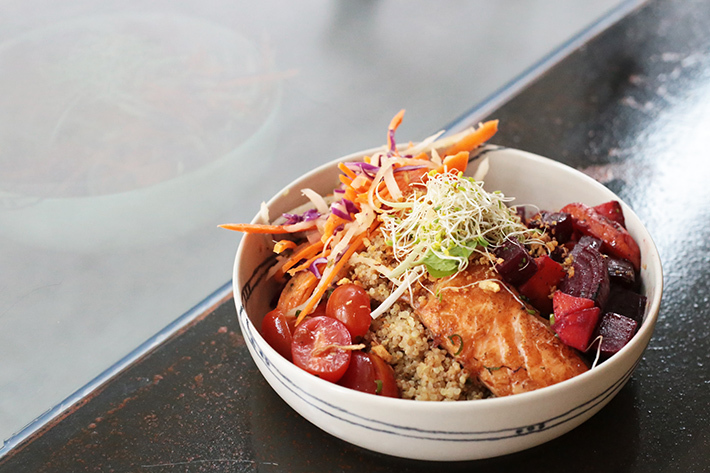 These bowls get you a protein, a hot veggie, 2 cold veggies, a topping, a sauce – all on top of your grain of choice. They are priced at S$16 each and you can customise them however you want. Of course, we were initially hesitant about the relatively high price, but after having our bowl, we can safely say that the taste than justifies it. For our bowl, we picked quinoa as our grain (and we got such a huge serving that could have fed two!) and salmon as our protein. Roasted beetroot and carrots were our hot veggie choice, and coleslaw and cherry tomatoes were the cold ones. Trust us when we say all the vegetables here are so fresh and with each component, you can really taste the effort put in to cook and flavour it. We topped off our bowl with some garlic & shallots, together with a sauce of coconut curry on the side for an extra oomph. Other choices include beetroot feta yogurt and Asian gravy for sauces, and you can even find striploin and seared tuna in the protein choices. One thing’s for sure – at Grain Traders, you certainly get more than what you paid for.